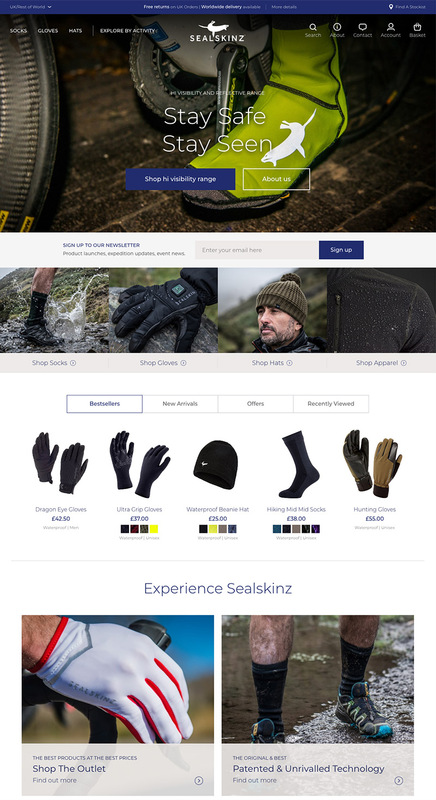 It’s been a busy month at blubolt with another website launch, this time for the innovative sporting retailer, Sealskinz. The growing company has an impressive 30 years experience in the industry, manufacturing the latest sporting accessories for some of the world’s greatest athletes. Tried and tested in real-life endurance competitions, Sealskinz were in need of a platform to better showcase their high-quality product range. Working together, we formulated a creative vision for their website. This includes key features for improved customer interaction and a new warehouse system to better meet their ambitious plans for online growth. The final site has allowed Sealskinz to create a brand experience that is more in-line with their company values. It showcases their high-quality range as well as their brand history and the technology involved in their products. Present across the whole site, it’s an enticing and exciting experience for their customers.